A year ahead of its launch in the US, MINI Countryman is confirmed to expand the MINI lineup to four variants. Note: U.S. product specifications are different from those announced in markets outside North America. All specifications presented in this press kit are provisional. The launch date for markets outside North America is fall 2010, and early 2011 for the U.S.
MINI is adding a fourth model to the family, opening up a new dimension of motoring with that unmistakable MINI exhilaration. The new MINI Countryman is a genuine crossover vehicle, and bridges the gap between the classic concept of the MINI and a modern Crossover. Boasting enhanced opportunities in urban mobility and beyond, the MINI Countryman offers that unique go-kart handling so typical of MINI, yet allows the brand to appeal to new target groups requiring extra space and flexibility. As the first model in the MINI range with four doors and a wide-opening rear lid, the MINI Countryman provides even greater freedom of space for truly versatile use, a slightly elevated seating position, and optimized driving comfort. Full integration of the passengers within the vehicle creates that driving experience so typical of MINI. The MINI Countryman maintains that go-kart feeling likewise so characteristic of MINI, and optional ALL4 all-wheel-drive offers an additional highlight for motoring enthusiasts. In a nutshell, the MINI Countryman offers all the characteristic features of the brand in terms of design, premium quality, handling, efficiency and customization in a new, modern style. The MINI Countryman carries on unique design characteristics such as superior style and quality, while combining new larger body dimensions, greater ground clearance and four doors. It also features short overhangs, a high window line, powerful stance on the wheels, and windows extending around the entire car create those unique proportions so typical of a MINI. At the same time, the MINI Countryman re-interprets the characteristic icons of a MINI such as the roofline, the hexagonal radiator grille element, the large headlights integrated in the engine lid with integrated side direction indicators, the prominent wheel arches and the upright rear light clusters. Measuring 161.3 inches in length, with a wheelbase of 102.2 inches, the MINI Countryman features an interior that offers a new dimension of space and function. The four-door body of the car combines the proportions typical of the brand with extra ground clearance and an elevated seating position, the MINI Countryman thus bridging the gap between the classic Mini and a modern Crossover Vehicle. From the start, the design of the MINI Countryman emanates a unique feeling of independence, performance, robustness and versatility, particularly the clear structure of the front end giving the MINI Countryman a mature and most respectable look of class and style. But at the same time the new model naturally retains that unique charm and individual flair so typical of MINI. Proceeding from the MINI design language, the MINI Countryman authentically visualizes the particular features of this very special car. Positioned almost upright, the front end bears out strong presence and serves to optimize pedestrian safety. The extra space within the car, in turn, is emphasized by extra-large windows and the individual shape of the roof. The particularly wide frame around the lower part of the body and the powerfully flared wheel arches highlight the robust character of the car and its all-wheel drive. With that typical MINI style now being conveyed to a new segment in absolute clarity and precision, the MINI Countryman stands out from the start as a brand-new, highly innovative model but is nevertheless clearly identifiable from the very beginning as a genuine MINI. The new diagonal function line at the transition point from the front side panel to the door likewise serves to distinguish the MINI Countryman from its counterparts within the range. This particular feature – yet another re-interpretation of the body welding seam at the same point on the classic Mini – comprises both the side direction indicator and the air outlet on the MINI Countryman. Conceived and designed as a wide and very robust-looking band, this diagonal function line continues the course of the A-pillar towards the front wheel. Like the C-pillar facing towards the rear axle, this special line again emphasizes the impression of a powerful body resting strongly on its wheels. The proportions and horizontal subdivision of the rear end also underlines the sporting character of the MINI Countryman, ensuring powerful presence also from this perspective. Broadening out in steps from top to bottom, the body structure emphasizes the stable stance of the car, the muscular shoulder line additionally highlighting the masculine character of the MINI Countryman. With its integrated, aerodynamically refined airflow contour, the roof appears to almost hover above the window areas. The chrome band extending round the entire car between the windows and the body, finally, forms yet another horizontal line as a further highlight in the design of the MINI Countryman. Like all models in the MINI range, the MINI Countryman comes with upright rear light clusters forming a distinctive contrast to the otherwise horizontal lines at the rear. Highlighted by chrome surrounds, the rear light clusters stand out three-dimensionally from the body of the car. Positioned far to the outside, the rear lights emphasize the width of the MINI Countryman and bear clear reference to the generous interior space. All light functions are integrated in the rear lights embedded like islands in the rear side panels. The inner structure of the lights is determined again in typical MINI style by full circles and circular sections also giving the car its unique night design. For the first time the MINI logo at the rear has a specific function: Pressing the inner circle on the logo allows the MINI owner to release the rear lid that is hinged at the top. The rear license plate recess takes up the shape of the air intake in the front bumper, thus linking the front and rear ends through their clear symbiosis in design. The rear air dam on the MINI Cooper S Countryman comes as a diffuser guiding the flow of air beneath the rear end of the car to optimize the aerodynamic qualities of this special model. The most powerful model in the range also stands out through its special roof spoiler, a twin-chamber exhaust system, as well as striking openings in the rear wheel arches. The MINI Countryman is available with a choice of at least eleven body colors: five non-metallic, and six metallic. All models are available with the roof finished either in Black, White or as an alternative, body color. Within the interior, the MINI Countryman boasts innovative design and function elements throughout. The slightly elevated seating position guarantees comfort and pleasant and optimizes the driver’s all-round view. The Central Display and air vents are highlighted by colored rings. The most unique interior feature is its innovative Center Rail system, which extends from the front to the rear replacing a conventional center console. It opens up new, individual options for integrating all kinds of storage boxes, cupholders, external audio devices, mobile telephones and other comfort features. It offers flexible clip-in elements enabling the driver and passengers to subdivide the storage boxes individually as required, keeping travel utensils within easy reach, wherever they are required. At the same time the Center Rail forms an unconventional, visual and functional connection between the front seats and the rear passenger compartment. The MINI Countryman offers superior comfort also on long distances, with generous legroom, headroom and shoulder freedom. The rear seats move fore-and-aft either individually and the backrests may be tilted for angle, increasing capacity in the luggage compartment from liters 12.2 –41.0 cu ft.
All surfaces come in a new, even more striking, textured grain that harmonizes perfectly with the powerful look of the car. The instrument panel in the MINI Countryman is characterized by concave shapes and a sporting, functional impression. Extra-large air vents at the side emphasize the particular style of the interior in its modern class and function. Like the center air vents, the center speedo and the gearshift lever, the air vents are highlighted by white surrounds in a contrasting color. A further color highlight is provided by the side surrounds on the center console appearing to actually support and hold up the dashboard. The center console itself, through its matt-black color in conjunction with a chrome ring for the climate controls, is particularly stylish and sophisticated in its looks. Apart from the control units for the air conditioning and CD player, the toggle switches for various car functions typical of MINI are also housed within the center console. Newly designed door panels underline the specific shape of the body and the extra space the MINI Countryman has to offer. The ellipsoid frame around the door armrests and door handles, again so typical of the brand, is for the first time positioned in the middle, encompassing in its design also the B-pillars and emphasizing the length of the interior through its stretched contours. The MINI Countryman comes with supportive bucket seats specific to this particular model. Sports seats are featured as standard on the MINI Cooper S Countryman (optional on the Cooper) and offer two different combinations of cloth/leather seating as well as various choices of all-leather upholstery as an option. A particular highlight is the top-of-the-line Lounge Leather upholstery that is reminiscent of classy leather seats with piping in a classic British car. The rear bucket seats featured at the rear move fore-and-aft 5.1inches independently of one another. Even with the seats in their upright position, the MINI Countryman is able to meet additional transport requirements as the rear seat backrests may be moved to a cargo position increasing luggage space from 12.2–15.4 cubic feet. With the rear seats folded down, cargo capacity increases to a commodious 41.0 cubic feet, enough for two mountain bikes with their front wheels removed. And for those that need more options to carry their adventure items, a standard low-profile roof rail system allows Motorers the ability to add a full line of MINI Accessory. Instead of a conventional center console between the seats, the MINI Countryman comes with an innovative rail system, the unique MINI Center Rail enabling the driver and passengers to keep their personal belongings and odds and ends exactly where they need them at any point in time. At the same time the MINI Center Rail forms a visual and functional connection between the front and rear seats. The Center Rail extends through the entire passenger compartment all the way to the rear seat backrests. Specially developed and easy-to-use clip-in fixtures allow the driver and passengers to use the MINI Center Rail individually as required, hanging on various bins and storage units. As an example, the MINI Center Rail may be fitted with holders for entertainment and telecommunication devices, cupholders, a case for sunglasses in genuine MINI design, as well as center armrests held safely and comfortably in position. The holders and storage bins placed on the Center Rail may then be moved forwards and backwards to any desired position. And whenever the users place electronic devices such as a mobile phone or an MP3 player on the Center Rail, the integrated cable system automatically connects the respective device to the car’s on-board network and ensures full and convenient integration into the MINI Countryman’s entertainment system. Ambient lighting, which is part of the standard light package, sets a particular highlight within the interior of the MINI Countryman. Providing an indirect lighting effect, ambient lightning creates special color highlights throughout the entire door panel in night design, thus giving the interior a truly unique atmosphere. Using a toggle switch, the driver and passengers may vary the color of the light generated steplessly from a warm orange to a sporting blue. Light rods also provide the color desired on the MINI Center Rail from one end to the other. This makes it easier to find objects attached to the Center Rail. The optional interior color lines provide further opportunities to customize the car, creating different color effects along the door panels within their ellipsoid frame, on the center armrest side panels, the lower section of the B-pillar covers, and the inserts on the Center Rail itself. The colors available in this case are Carbon Black, Polar Beige, Pure Red, and Dark Tobacco, as well as powerful Surf Blue exclusive to the MINI Cooper S Countryman. Trim bars for the cockpit as well as a Chrome Package adding discreet gloss to the air vents, the central instrument, the rev counter and the surrounds on the gearshift lever, provide an even more intense touch of color and style. The MINI Countryman is entering the US market with a choice of two engines, each coming in the new generation of power units developed with masterful engineering and naturally, comply with ULEV II emission standards. The rev-happy 1.6-liter four-cylinder gasoline engine in the Cooper offers fuel efficiency and performance with fully variable valve timing and lift via VALVETRONIC technology. The Cooper S adds a twin-scroll turbocharger and direct fuel injection. It also features fully-variable valve management offering the best balance of engine power and fuel consumption in its class. And as an alternative to the standard six-speed manual gearbox, both Cooper and Cooper S models are also available with a six-speed automatic transmission complete with manual control. All engines featured in the MINI Countryman come with fully variable valve management. This technology for masterminding engine load without requiring a throttle to control engine output is quite unique within the segment of this new MINI and is based on the VALVETRONIC valve management system featured in BMW power units. This optimizes engine response and serves to significantly reduce both fuel consumption and emissions. Valve management adjusts the lift and duration of the intake valves within fractions of a second to the respective level of power required. The intake camshaft acts on the valves through an additional intermediate lever, and not directly through the follower arm. The rotating point of this additional lever is adjusted infinitely by an eccentric shaft controlled by an electric motor. MINI Cooper Countryman: Four-cylinder gasoline engine with fully-variable valve management based on the BMW Group’s VALVETRONIC technology. Max torque: at least 118 lb-ft at 4,250 rpm. MINI Cooper S Countryman: Four-cylinder gasoline engine with twin-scroll turbocharger, direct fuel injection and fully-variable valve management based on the BMW Group’s VALVETRONIC technology. Max torque: at least 177 lb-ft at 1,600 rpm (at least 192 lb-ft with Overboost). On the Cooper S Countryman with ALL4, a specific driveline setup is used. Together with the elaborate mounting for the final drive and individual driveshafts, a vibration damper is fitted is within the rear driveshaft giving the ALL4 version of the MINI Countryman the same high standard of acoustic and dynamic comfort as on the models with front-wheel drive. Designed for optimum safety in the event of a collision, the body structure, with its precisely defined load paths and deformation zones, ensures passive safety of the highest caliber. A total of six airbags are standard, with frontal and side airbags as well as side curtain airbags for both front and rear occupants. Three-point inertia-reel seat belts are present on all four seats and belt latch tensioners and belt force limiters at the front, as well as LATCH child seat fastenings at the rear all come as standard. Yet another standard feature is the Tire Pressure Monitor. In terms of crash behavior, there is no compromise between the front-wheel and all-wheel drive versions of the MINI Countryman. To ensure this equality, the car comes with an innovative drive shaft made up of two elements giving way within one another in the event of a collision to absorb impact energy. The body structure of the MINI Countryman is also designed to offer maximum occupant safety in the event of a collision, high-load-resistant bearer structures, precisely defined deformation zones and an extremely stable passenger cell serving to keep impact forces away from the passengers. The MINI Countryman furthermore comes standard with DSC (Dynamic Stability Control) and DTC (Dynamic Traction Control) is an option that also features an electronic limited-slip function for the front axle differential. 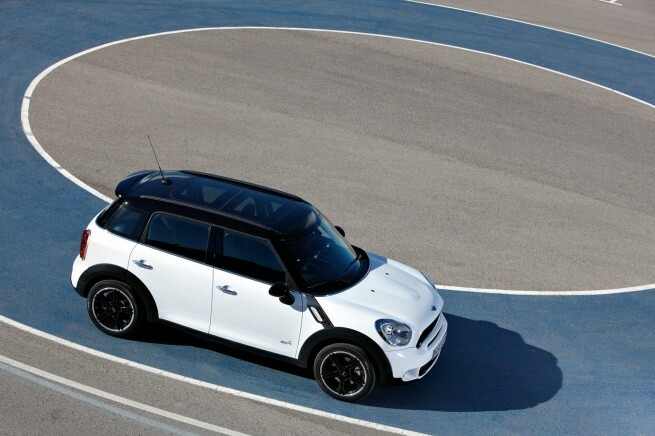 All Countryman models comes standard with 205/50 R17 runflat tires for supreme safety and performance in all situations. Available optionally are 18’’ alloy wheels with runflat tires and 19” wheels can be ordered as a dealer-installed accessory. The wide range of customization options on both the exterior and interior again so typical of MINI are supplemented by new, model-specific features exclusive to the MINI Countryman. New combinations in the range of interior colors, trim strips and upholstery enable even the most discerning customer to create his – or her – very special car with truly unique character. The wide range of standard features boasted by the MINI Countryman includes highlights such a multi-function steering wheel with cruise control, the MINI Center Rail, and a premium six-speaker audio system complete with a CD player and AUX IN. The equally wide range of options and special equipment tailored to each model comes with features such as high-end audio and navigation systems as well as mobile telephone interfaces including the option to completely integrate an Apple iPhone® and other smartphones in the car. Further options are the dual-pane Panoramic sunroof, Adaptive Headlights in combination with the optional Xenon headlight units, lightweight-alloy wheels ranging in size from 17 to 18 inches, sports suspension (which lowers the car by 10 millimeters or almost 0.4″), as well as the wide range of John Cooper Works Performance Components. For the US, the Countryman’s three versions – Cooper Countryman, Cooper S Countryman and Cooper S Countryman ALL4 – will be offered for sale in early 2011. Pricing will be announced at a later date. As the fourth model within the MINI range and the first premium car of its kind, the MINI Countryman is a pioneer in many respects. It opens up that characteristic MINI feeling for new target groups and at the same time transfers individual design and the unique fun of motoring into a segment with greater demands in terms of space available, diversity and motoring comfort, thus opening up new perspectives for the MINI brand as a whole. Through this extension of the model range, the MINI brand once again proves its ability to grow with the demands of its fans and followers, while remaining true to its particular character.